It’s almost as if Helen Simoneau is living two lives. A French-speaking Québécoise, she arrived at the University of North Carolina School of the Arts at 17 to study dance, and her now-flawless English even has a slight Southern twang. Her six-year-old company splits its time between Winston-Salem, North Carolina, and New York City. 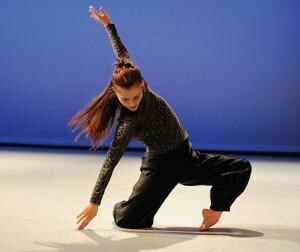 Even her choreography includes duality: Simoneau is just as at ease crafting limb-flung, space-eating group work (Paper Wings, originally for 19 dancers) as she is when creating introspective, compact solos (her award-winning the gentleness was in her hands). Her most recent work, which premieres March 3–5 in Winston-Salem, had its first life as a solo for Simoneau herself. Now she’s translated that solo, Caribou, about her Canadian heritage and American assimilation, into a dance for eight.